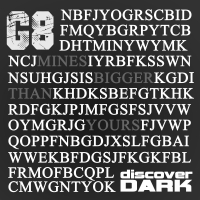 G8 delivers his debut artist album - Mine Is Bigger Than Yours for Discover Dark and what a stunning album it is. Following on from a string of high profile releases across the various Discover labels and beyond, G8 has delivered a full on techno album that is a force to be reckoned with. 10 tracks, 1 DJ mix and a lifetime of influences is the album in a nutshell. No edited tracks here. The album sits in its entirety from the outset with club friendly tracks that are also more than a little bit unsociable! Harsh and beautiful in equal measures - the opening track Babayaga signals the intent and the remaining 9 tunes carry the sonic baton from there on in. The G8 trademark funk is of course prevalent throughout - all wrapped up in techno finery. Creating an album full of techno tracks that will engage the listener for 60 minutes is no mean feat. And G8 has done exactly that. Mine Is Bigger Than Yours is a statement of intent - ignore it at your peril. 'Mine Is Bigger Than Yours' is available now from Beatport and iTunes.